Christmas shopping for someone who loves Irish culture, fashion, and symbolism? The Irish jewelry section of the IrishCentral Shop has just what you need. With prices to suit every budget and styles both dazzling and understated, the jewelry selection has something for nearly everyone on your Christmas list. What's more, as part of a special 12 Days of Christmas sale, select jewelry pieces are now 15% off. 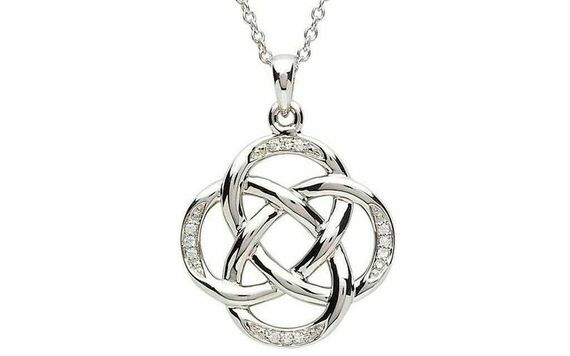 Beautiful necklaces of silver and gold, featuring designs such as Celtic knots, Irish crosses, Claddagh symbols, and shamrocks, adorned with Swarovski crystal and pearl. The Irish pendant selection in the IrishCentral shop is vast, with 151 items so you can be sure to find the perfect fit. Preuse the Irish pendant selection here. Get inspired by more Irish Christmas gift ideas in the IrishCentral Shop.